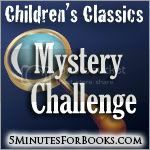 Tuesday is the first link up for the Children's Classics Mystery Challenge at 5 Minutes for Books and your first opportunity to share about your favorite characters, share your future reading plans or share whatever it is that you have read so far. I plan on reading from a variety of series during this particular challenge but is it really right for me to start off with anyone other than Nancy Drew? I think I should be hard pressed not to. Now, I assume you know, but if you don't, Grosset & Dunlap have made a regular habit of updating Nancy Drew to keep her up with the current times. She originally debuted in 1930 as a lovely, capable 16 year old girl who had a naturally quick mind and a knack at feeling out a mystery story. Created by Edward Stratemeyer and "brought to life" by Mildred A. Wirt Benson (doesn't Carolyn Keene sound melodic in comparison!? ), she has survived decades of young girls, always maintaining an air of youthful fascination about her. 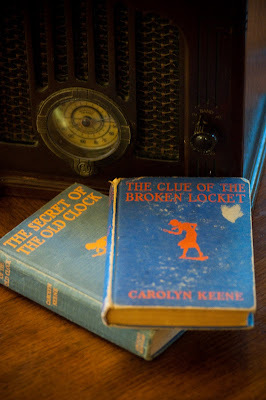 The background of Nancy Drew is really quite interesting to read and if you'd like to familiarize yourself a bit more with it, I would redirect you to a specific site discussing The History of Nancy Drew. My memories of Nancy Drew are vivid. My best friend and I lived and breathed her (and Trixie Belden) for a good long while and did our best to scrounge up and create our own mysteries out of thin air. 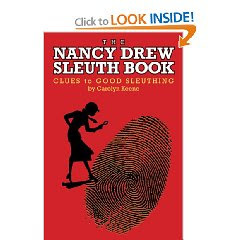 One of the prides of my young life was securing a copy of The Nancy Drew Sleuth Book which we dutifully poured over for hours. We created code names for various areas around the church building where we attended and spent a great deal of time hanging out. We'd write each other notes during church in our own secret code. "Meet me at squirrel mountain." (The name for the back of the church office building where a tree was located that housed maybe one squirrel on a good day.) According to the notes which I "secretly stashed" away in the very book itself (and carried around with me everywhere), we only had one mystery to solve concerning one of our friends, if you could call it that. Apparently we were very desperate for A mystery. Anything would do. Any conversation that looked as if it was meant to be private between other people was suddenly fair game for us to snoop around about. We meant well although I suspect we were severely misguided at times. But we did figure out pretty quickly who had a crush on who. I love Nancy Drew. I think she's bright, respectful and just plain, clean fun. Of all the book series that I read growing up (and I did read my fair share!) I'd say that these were probably the ones that got my imagination running at the best and most healthiest pace and which I thoroughly enjoyed. Thank you, South Texas Public Libraries, for feeling the need to modernize your collection and for sanctifying mine in the process. I owe a debt of gratitude to you! Do you have a particularly strong or vivid memory of Nancy Drew to share? I'd love to hear about it if you do! Create a post and link up to the Challenge or leave a comment below. Either way I'll track you down (and I know how to do that now, thanks to The Nancy Drew Sleuth Book and Google) and hear you story. 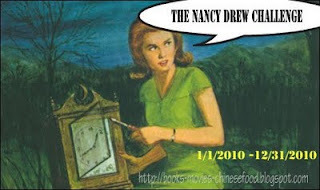 I'm also linking this up to the Nancy Drew Reading Challenge hosted by Books, Movies & Chinese Food. I too have started collecting the oldest ones when i can find them at the thrift stores. Just amazing that you're a generation younger and also read Trixie Belden! Nobody i know has heard of her. I felt part of her family. But for me, of course, the Cherry Ames books, about a student nurse and her subsequent career escapades (she solved mysteries, too) were the best. I found them originally on my aunt's bookshelf, and eventually devoured all of those, too. I think they had a big influence on my nascent desire to be a nurse. I find it interesting that the '30s volumes are different from the '50s ones. I'd like to read them myself to see how they're changed. Also - fantastic finds at the used bookstore! I think my original set of Nancy Drews, 30 books that my parents bought me for Christmas one year, were the 1930's editions. I'm not absolutely sure. They were the blue-backed books that look like the ones in your picture. For some reason we left those books in our old house when we moved when I was about 13 years old. I surely would like to have them back. Loved Nancy Drew and Trixie Belden as a kid. I was always so sad that I didn't have a group of friends to pal around with like they did. I'm definitely trying to track down all the original ones with Nancy being 16.